The American Geriatrics Society (AGS) recently released the consensus statement “Vitamin D for Prevention of Falls and Their Consequences in Older Adults.” The publication provides clinical guidance for the use of vitamin D supplements, with or without calcium, in older patients for the prevention of falls and fractures. This information is essential for all providers furnishing health care for older adults, including primary care physicians, internists, geriatricians, and nurse practitioners. The committee was composed of both basic and clinical scientists expert in vitamin D and geriatricians with clinical research and clinical experience related to falls and/or vitamin D. The CDC and the AGS committee recognized that in the near future, there would be no massive study that could answer all the questions about the magnitude of protection that adequate vitamin D supplementation would provide to healthy elderly and frail elderly. In the meantime, the committee worked to help practitioners provide good advice to their patients who are likely to fall and sustain injuries in the next several years. There is an urgency here. Judge: The committee agreed that there was enough evidence that higher-level supplementation doses of vitamin D used in trials had reduced falls. In addition, serum concentrations < 30 ng/mL (< 75 nmol/L) have been associated with balance problems, impaired lower extremity function, higher fall rates, lower bone mineral density, and muscle weakness. F. Michael Gloth III, MD, Johns Hopkins University: Based on calculations from the IOM’s 2011 publication “Dietary Reference Intakes for Calcium and Vitamin D’s Dose Response Estimates,” only about one-half of adults over the age of 71 will achieve a 25(OH)D blood level of 30 ng/ml (75 nmol/L) with a daily supplement of 1,000 IU. The AGS guidelines take into account the increased risk of falls and fractures, and the clinical reality of less compliance than would be traditionally found in research study environments. Using a goal of achieving the 30 ng/mL level in more than 90% of the population, the higher vitamin D recommendations from the AGS make sense. The recommendations are actually quite consistent with the IOM, however. In fact, some of the recommendations from the AGS come from information in the IOM report. The safety of the recommendation of 4,000 IU per day is consistent with IOM, and the overall input from all sources (sunlight, diet, etc) is, in part, calculated from the same data presented in the IOM report. Judge: Clinicians generally do not need to measure vitamin D levels in patients receiving adequate supplementation. The exceptions are patients who are obese, defined as having a body mass index higher than 30 kg/m2; malabsorption syndromes; and/or patients who use medications that either bind vitamin D in the gut or accelerate the breakdown of vitamin D. These medications include cholestyramine and inducers of the cytochrome P450 pathway, such as phenytoin and phenobarbital. We know that obese individuals have lower vitamin D levels and will need more supplementation. Deeper pigmentation is associated with lower vitamin D levels, but there is evolving information that vitamin D levels in African Americans may not reflect the bioavailability of vitamin D. Also vitamin D levels in the late summer and fall are higher. Our best estimate is that the seasonal variation in total vitamin D generation from sunlight is roughly 1,000 IU/day. A table on page 22 of the AGS statement can help clinicians determine which patients are in need of higher supplement doses and how they can easily determine how much they need based on dietary, sunlight, and supplement exposure. Douglas P. Kiel, MD, MPH, Harvard Medical School: Long term care residents typically have a limited vitamin D intake from all sources. Diets are often not rich in dairy or oily fish; residents do not get adequate sun exposure, especially in northern latitudes; and even supplementation may be inadequate. For these reasons, vitamin D insufficiency is quite prevalent. The AGS report recommends that all long term care residents be evaluated for their sources of vitamin D intake from sun, diet, and supplements. At least 1,000 IU is recommended, and in cases where the dietary and sun-based intakes are low, it is reasonable to increase the supplement dose to as high as 4,000 IU/day. There is little or no toxicity at these levels of supplementation, and the cost is negligible. Data currently suggest that vitamin D prevents falls in long term care residents, especially those who are likely to be deficient. • Patients given adequate supplementation generally do not need to undergo vitamin D level measurement. However, vitamin D levels should be measured in patients who are obese (BMI > 30 kg/m2), have malabsorption syndromes, and/or use of medications that either bind vitamin D in the gut or accelerate vitamin D breakdown (eg, cholestyramine, phenytoin, phenobarbital). 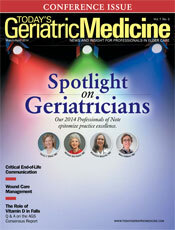 • Discuss strategies for adequate vitamin D and calcium supplementation with your older patients and their caregivers. Available evidence does not support a recommendation for increased vitamin D supplementation without calcium for older people. Supplemental calcium doses in most studies range between 500 and 1,200 mg daily. Remember to count up patients’ calcium from food intake to determine supplemental calcium dose. • Help your patients and their caregivers choose the vitamin D and calcium supplementation schedule they are most likely to follow. Various vitamin D supplements may be taken daily, weekly, or monthly, and different combinations of calcium and vitamin D supplements are available.